Gender Identity and Sexual Orientation: Gender is Performative. My pronouns are she/her/hers or anything respectful. Why do you want to write for Rescripted? : I’ve been thinking a lot recently about how I can contribute more as an audience member just as much as a theatre-maker, and I’ve been considering reviewing productions. Rescripted’s mission to contribute to the historical record of our theatre and to provide different audience lenses in critique really resonates with me. I think critique is imperative to the continued growth of art and its relationship to audience, and it needs to reflect the time and culture that we are in. Sarah Kane – Was a wonderful poet and chose to write plays that endanger the safety of her audience’s paradigm. She was unapologetic, demanding that audiences grapple with the horrors that humans perpetuate. Sarah’s work was also extremely personal, and that’s where her work is dangerous: It’s true. When we witness art, any art, we cannot help but to consider our relationship to it, and her truth might also be ours. Julie Taymor – Julie makes the kind of theatre that I want to make. She creates large, vibrant worlds like we created as children. Her work ignites the imagination and earns the attention of her audience. If theatre has attention, it has a better chance of affecting. Why make theatre that does anything less? If they’re present, they will learn. Website and/or Bio: Gaby Labotka is an actor, director, choreographer, and more living and working in the city of Chicago. Recent performance credits include: A Story Told in Seven Fights (Neo-Futurists); We’re Gonna Be Okay (ATC); Peter and the Starcatcher (Metropolis Theatre Company); Henry V (Babes with Blades); Romeo and Juliet (Teatro Vista); and The Hammer Trinity (The House Theatre of Chicago). Recent choreography credits include: Hamlet (The Gift); Through the Elevated Line (Silk Road Rising); A Story Told in Seven Fights (Neo-Futurists); Dontrell, Who Kissed the Sea (First Floor Theater); The Good Fight (Babes with Blades); ‘Twas the Night Before Christmas (Emerald City Theatre); A Swell in the Ground (The Gift); Night in Alachua County (WildClaw Theatre); and Romeo and Juliet (Teatro Vista, 2017). Recent directing credits include: Wasteland Hero (Reutan Collective) [Trans]formation (The Living Canvas); and The Dictionary Project. 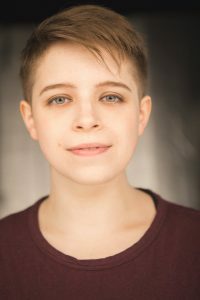 Gaby is an Advanced Actor Combatant with the Society of American Fight Directors, has received training from Intimacy Directors International, and is often a Teaching Assistant for stage combat classes at MACE and The Actors’ Gymnasium. Gaby is the Associate Artistic Director of the Chicago Theatre Marathon, a proud member of ALTA; and she is a fierce advocate for respect, empathy, representation, inclusion, and safety in the theatre. Check out more: https://www.facebook.com/GabyLabotka.Theatre/ Keep Smiling! Flossyfluff: Spirit Force Five at Factory Theatre, July 19th, 2018.